Around 50 survivor participated in the survivors lap during Relay For Life on Friday, June 5 at the Preble County Fairground. The event celebrates those who have defeated cancer as well as remembers those who lost their life’s due to the disease while raising money for cancer research and for families currently battling cancer. Survivors (Purple) and Caretakers (White) participated in Relay For Life in order to help raise money for cancer research. 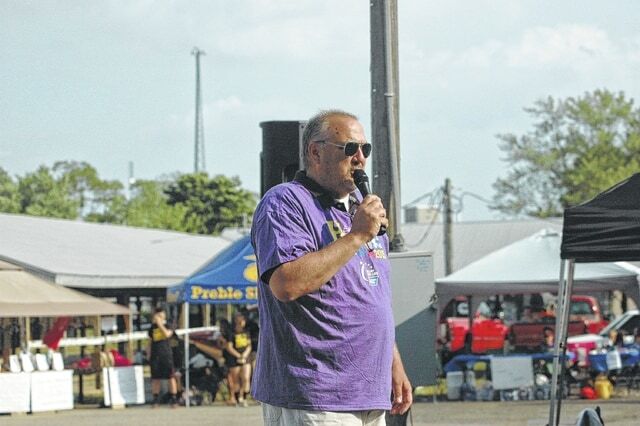 Over 200 people partipcated in the Relay For Life held at the Preble County Fairgrounds on Friday, June 6 and helped raised over $13,000 and counting over the course of the year for The American Cancer Society. Guy Fogel speaks to the crowd and fellow cancer survivors during the opening ceremonies of Relay For Life. The event was hosted on Friday, June 6 at the Preble County Fair grounds and helped raised over $13,000 for the American Cancer Society. EATON — Some 200 walkers and survivors participated in the American Cancer Society Relay For Life in Preble County at the Preble County Fairgrounds on Friday, June 5, in Eaton. Currently, the teams who participated in the event have raised over $13,000 for the American Cancer Society. Proceeds will go to cancer research, local residents who are battling the disease, and will help to hopefully one day find a cure for the disease. The event was part of the Relay For Life 30-year anniversary. According to the American Cancer Society, the first Relay for Life started when Dr. Gordy Klatt wanted to raise money for his local American Cancer Society chapter and show support for his patients battling the disease. Klatt who recently passed away from cancer himself, rose over $27,000 on a May night in 1985 when he walked or ran for 24 straight hours totaling over 83 miles creating Relay for Life in the process. According to Alice Lajeunesse of the American Cancer Society, walking through the night is symbolic for the journey of a person battling cancer. The sun going down represents the initial phase of being diagnosed as it feels the “light” is fading away. Walking through the middle of the night represents the darkest part of the journey where cancer patients often feel that defeating the disease is no longer possible and all hope is lost. However for those who continue to walk through the darkest part of the journey a dawn awaits them that brings new hope and life. The event featured games and activities for those participating throughout the night but began with an opening ceremony where local cancer survivor Guy Fogel spoke to those in attendance and had a special message for his fellow cancer survivors. The opening ceremonies conclude with a survivor’s lap where around 50 survivors represented by purple shirts walked a lap to a song titled “Overcomer” by Mandisa before being joined by caretakers who wore white shirts on the next lap. Perhaps the reason for Relay For Life was best summarized by Suzannah Haag who told the crowd, “We are here to celebrate, remember, and fight back”.